Lora and blynk local server? Hi friends. 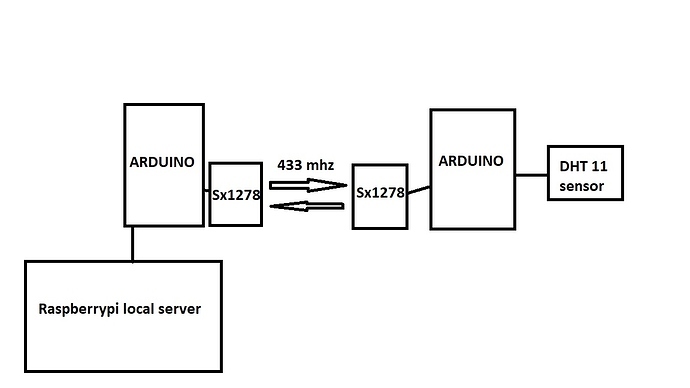 Is any example how to connect the sx1278 lora to blynk local server ? Can you explain your question a little better? Are you looking for example code where an Arduino is attached to that Lora board? Thanks for reply. Yes I want to connecting the lora to my raspberrypi usb and use as lora gateway. But I don’t know how can I do it and how to connect the arduino side to the gateway. Way out of my league. I think it might be best to find a way to get it be a hub first. THEN figure out how to get blynk to talk through it. Link the Sx1278 directly to your RPi without using the Arduino. This would need some sort of library on your RPi to decode the incoming LoRa packets (which will presumably come via UART, SPI or I2C). Don’t make a direct connection to the RPi from your Arduino - instead add an Ethernet or ESP-01 and send the data across your network, or better still use an NodeMCU instead of the Arduino. If you go for the schematic in your drawing then communication between the Arduino and the RPi would need to be via serial or alternative bus protocol. How you read that data in the RPi will depend on what language you’re using to program it. Personally, I’d go for my 2nd alternative above. I’ve never use LoRa, but I’ve read quite a bit about it and this post prompted me to do a bit of searching on AliExpress and Github. It seems that there are some nice libraries available that take the hassle out of point to point LoRa communications, but most of these only work with a limited range of LoRa hardware. The cheap modules on AliExpress use serial output to the MCU, but the libraries I looked at are written to work with SPI devices. We want start a big project in ours city with blynk and our city must have full coverage for the communication with blynk server from arduino’s. of course I want to connect the arduino with ethernet to the respaberrypi local server not with serial. my problem is how to connect site to site arduino with lora and how to play with blynk sketch to communicate with lora and blynk local server or cloud server ? is any example of arduino code with blynk and lora library ? Take an example of a simple project where you wanted to take a remote temperature reading and have the data appear in Blynk. The remote Arduino would do the temperature readings in the normal way, say once every minute. This data would then be sent to the LoRa transmitter, probably by passing it to a LoRa library along with data on which receiver node it was destined for. There wouldn’t be any Blynk code running on this remote node. The receiver node would be running Blynk code, or maybe use the Blynk API, and would monitor the data coming from the LoRa transmitter module. If this is a serial input then it needs to be monitored all the time, unless it does some buffering, but if it’s SPI or I2C then the monitoring can be done in the background - like an interrupt. When a message is extracted, the LoRa library should just be able to spit out the data element of the packet, but if not then the other info such as node address can be parsed out leaving just the temperature data. This data can then be pushed to the Blynk server using a normal virtualWrite command or a API call. However, if your talking about using Lora as an alternative to Wi-Fi, to give a city-wide network of sensors that can give two way ad-hoc communication between nodes then I think you need to look at LoRaWAN and simply communicate with nodes via an internet to LoRaWAN gateway. In this case it’s a project for a network infrastructure company. Thanks for your time. Ok I’m starting to play with sketch to communicating between devices. I’m report the result here if success.